Happy Earth Day everyone! What better way to celebrate than a Giveaway of Earth Friendly Fabrics! And you’ll be very pleased to know that this Giveaway spans 11 other blogs, Thanks to Daisy Janie for putting this amazing Blog Hop together, you can hop along with 11 other giveaways of 100% Organic Fabrics. Please enter all the contests for a better chance to win! We here at Birch Fabrics feel so passionately about doing our part for the environment that we’ve joined forces with many other companies to provide an environmentally-friendly cotton alternative for the quilting and crafting community. We are so pleased to walk along sides with all these Wonderful Companies that are making a difference. 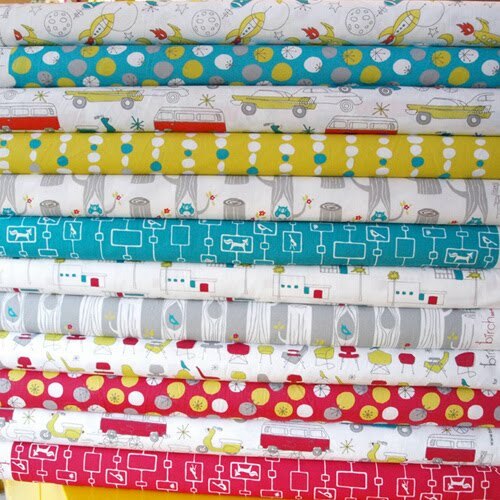 The prize for our giveaway is a complete fat quarter set of the entire Circa 50 range by Monaluna for Birch Fabrics. You will receive 1 fat quarter of all 12 prints in the collection. The set will ship out as soon as the fabric arrives in early June. To enter the giveaway please tell us what makes Earth Day special for you, and how will you help make a difference Today! 1. let us know that you’ve become a follower Birch Fabrics. Now head over to these blogs to enter their giveaways! The giveaway will end at midnight, Mon, 4/26 10am EST. OH MY!!!!!! YES! I'm a follower! I "like" you on Facebook too!!! Earth Day is, in part, special to me because it's my hubby's birthday. But, it's become more special now that we have a daughter to share our love for nature and the earth with. We look forward to showing her what the world means to us and hopefully watch her grow into her own little tree hugging self! And, of course I'm a follower! Thank you for this wonderful chance! Fingers crossed!! This is a fantastic giveaway. I found you from Betz. Earth Day is a day to be reminded what we hope to live…a greener lifestyle filled with natural materials in our home, real food in our bellies, and responsible and sustainable consumption. It is a wonderful day to celebrate the progress of everyone, and be inspired by others. This year we are getting the plastics out of our life. So far this has been a difficult task…but we are working on it! happy Earth day. 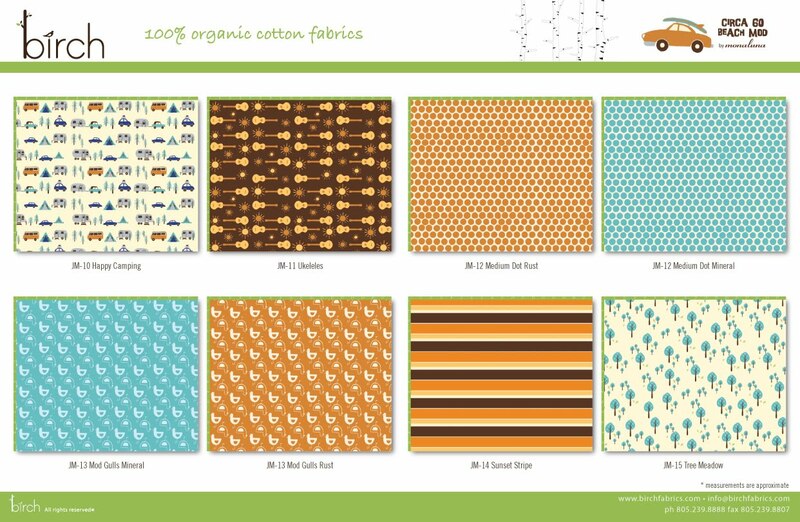 BTW, I have been looking for "car" fabrics for my son's quilt (which is still in my head…) yours are perfect! I am loving this fabric! I am also a follower now!!! I like Earth Day because it reminds people that we can make a difference with the choices we make. I am trying to stop buying cheap clothing that has to be thrown away after a season. I am trying to buy from responsible manufacturers and I'm also making my own clothes so they will last for years! I love Earth Day because I love all things "green". With one little girl and twins on the way, I want to make the world a better place for them! I'm using less plastic and more glass. I've enjoyed Earth Day products as of late…I love that there are options to buy "green" toys for my boys, and "green" fabrics and cleaners to use in my home that won't harm us and still keep our planet a little cleaner. I've added Birch fabrics as a Facebook friend :)….wonderful! I like Earth Day because it reminds people to be more aware of the environment. I take my reusable shopping bags with me to the grocery store, bookstores, etc. Basically anywhere I go shopping. I have several that fold up so small I can fit them in my regular bag. Awesome! I love your Circa 50 fabric collection, and your new ones look awesome, too!! I "liked" you on FB. I do small things to help, we use glass plates and not paper plates any more. Recycle anything and everything we can! !Thank you for this chance. Earth Day may become more special if I happen to deliver my baby! 🙂 Today I was out with my four children for our annual spring wildflower walk — we found about 18 different kinds. There is nothing more wonderful than enjoying the beauty of creation. I've becoma a follower and must say I really like your designs! Thanks for having such a wonderful give away, Sharonj. I am not sure if you know this but only one of your links to the other shops work. We're friends on Facebook now. Thanks! Earth Day has become more special to me as I grow older and realize what harm we do as we pass thru. I recycle more, use less and use organic whenever I can! I'm going to follow your blog as well! First time that I did all three…Just tweeted, that's how bad I want to win. Earth Day is special to me here in New Zealand because it acts as a reminder to appreciate the fresh air and beauty we have all around us here. Love the fabrics and will become more of a follower now I have found you! Earth Day is special for me because my husband and I are growing a vegetable garden and I want to make sure everything we grow and eat is completely safe and green for the environment. What makes Earth Day special for me, it the love of nature that my children have! My oldest daughter amazes me with the ideas she comes up with to help the planet! Thanks for the chance! Earth Day is special to me because it makes me aware of how fragile our Earth is, and how important it is to protect our natural resources so they will be there for our children's children. I am recycling, gardening and doing some composting. Love this. I'm a follower and liked you on facebook. Nobody really follows my tweets so it really doesn't count as much. I will tweet this! I will add you on face book! Earth day is very important everyday. I have children and 1 grandchild. Our planet is our home we need to care for her! I have a garden and am starting a compost pile this year! I would use your fabric to make a bag to carry groceries/purchases in. Thanks for the chance! I just discovered you via Betz White. Earth day always reminds me of fun outdoor adventures growing up, hopefully my kids will feel the same. Thanks for the chance to win. I feel Earth day is a day to realize that our actions, (even small ones), make a difference to the world around us. From picking up our trash, to using reusable grocery bags, to utilizing natural pest controls instead of insecticides. Every little bit that we do can, and will make a difference. And I just "liked you" on facebook. And Earth Day is special for me because it is my sons birthday. We just planted a few new trees in the backyard, hopefully to cut down on the air conditioner use in the summer time. they will also make nice hammock holders when they get bigger. Earth Day is extra special this year because my daughter is now 3-years-old, and she is really starting to understand the concept of recycling, conserving, and protecting nature. I plan on going on a nature walk with her tomorrow! Earth Day is important to me because it helps raise awareness in all of us to be more mindful of the impact of our actions and everyday activities. Earth Day is special to me because it brings more awareness to how lucky we are. We are big recyclers, actually today was our pickup day, and our compost bin is always in use and trying to teach my daughter what goes where! Earth Day has really made me think about my own habits and what I can do to make a difference. wow, i love these fabrics. Earth Day is special because it's a chance for everyone to be on the same page and take action to celebrate/respect our beautiful earth. Just retweeted your post on twitter . . . have fun. Earth day is a great reminder that all the little things we can do to help the earth add up to something big. and I'm a follower (who loves the new Marine collection!). I'm making an effort to buy more green products-cleaning, paper products, etc. Earth Day is special to me because I love plants, gardening, and wilderness. I'm continuing with my efforts to not buy anything new unless I absolutely cannot make do with something I already have, or can buy second hand, and by trying to buy mostly in season foods, grown as locally as is reasonable. This requires more patience and thinking, but is a great penny saver too. I think its about balance – you don't have to give up your lifestyle, you just have to change how you achieve it. Earth Day is special to me because it raises awareness about being earth friendly. I have been doing my best to make a difference no matter how small. I use cloth grocery bags, recycle, and I use cleaning products that are safe for the environment. I am a follower of Birch Fabrics. Such cute fabrics…trying to remember to unplug all those "vampire" electronics and keep up the recycling. My kids and I are picking up trash that blows onto our farm. What a sweet giveaway! Came to you from True Up. for earth day I am crafting with recycled or is that upcycled materials. I'm making do with no new clothes for this season and trying to use less! I'm a bit of a tree hugger so my hope is with every passing earth day more and more people become more concerned about our planet. Wow, congratulations on such a beautiful new release! My three year olds have started picking up trash that blows onto our land, especially plastic bags and wrappings that might entrap birds. They are so earnest about protecting the small creatures–it warms my heart! It's cheesy, but every day is earth day for me. I filled up my car's gas tank in January … and it's still half full. I bike, buy all used clothes, grow some of my own food, etc. I just wish the mainstream world would care more about the state of our fragile marble — and not just on earth day. Sometimes it's hard to keep up the enthusiasm, though seeing more and more fabric companies going to organic cotton is certainly motivating for this quilter. I use reusable tote bags for my groceries, to avoid the whole paper or plastic issue. Earth Day is special to me because it is a day to share with my kids and teach them the reasons behind why we compost, recycle and reuse everyday. I "liked" you on Facebook also. OMG!! Circa 60 is awesome! I'm so getting that when it's in!!!! Love it!! Earth day is special to me because it reminds me that the recycling that we do is all for a reason. and reminds me to turn off a few extra things in the home, ride a bike or walk when i can and preserve this glorious planet for the future! I'm now a follower! YAY! I'm loving my trek through the links of all these fabulous designers/printers/stores. What fun and beautiful fabrics, and you feel great supporting such entrepreneurs. Earth day is special to me because it like a fun party day to celebrate nature. It kind of renews my vow to be good to the earth during the year. I love feeling like I'm part of a fun conspiracy to clean up and love the planet! Happy Earth Day! I recently switched to a more "eco friendly" feminine product so I don't throw anything away every month! Earth Day to me is about the little things. Its remembering to conserve water, recycle more and reuse items. I love discovering ways to reuse things. Your fabrics are fabulous. I love that Earth Day reminds us all to come together to remind one another of what is important: biodiversity, taking care of our earth, consuming less and consuming wisely, etc. For Earth Day this year, I plan to make some repurposed/upcycled projects to give to friends and family and plant green, growing things in my garden. I follow your blog! I love your fabric designs, and am glad your giveaway brought me to you! What's we do on earth day is get out in our yard and plant flowers, veggies, everything we can to reduce our carbon footprint! Love your fabrics!!!! Today, Earth Day, has been car free for me and I'm working toward more care free days this summer. Oh, and I do follow you on twitter. Earth Day this year is about giving away a lot of our extra things via Freecycle. We are moving next week, and the more we reduce, the less waste we make in the move. Keeping our still good mattress, diaper pail etc out of the landfill just helps everyone out. PS- I posted links to your upcoming fabric line on a couple FB submarine wives groups. I love submarine fabric for my future submariner toddler! I will become a FB fan of you too. Happy Earth Day. We have been planting flowers and will be planting 2 new trees. I will be recycling everything I can get my hands on and creating items made with recycled goods. For Earth Day, I'm staying home and sewing (what a sacrifice, right?) But seriously, I'm very careful to limit my driving to what's absolutely necessary and mapping out my errands so I can knock out a bunch of "to do's" at once. Earth Day should be celebrated everyday, but it is a good reminder to take care of our mother earth. I plan on celebrating Earth Day and every day by simplifying and living with less. Seriously, I am almost crying over how cute of a quilt I could make with your stuff. Wonderful giveaway, can't wait to see this new line!! Earth day and everyday, we recylce everything we can, and all food scraps go to Ruby our pet pig! Earth day is special because so many folks are focused on being green. I try to make a difference in as many small ways as I can every day. Thanks for the great contest, these fabrics are so cute! I also became a follower of Birch Fabrics and Tweeted about this. Earth Day is special this year because the kids have gotten all excited about it at school! Earth day is to remind us to live responsibly. We should never take clean air, water, or any other natural resource for granted. while earth day is a day where i hope to bring awareness to being good to the earth, i do try to help out on an everyday basis. i am planning some earth-friendly crafts and activities with the kids, it's important for them to understand! I will probably spend the day outside working on my garden! Earth Day is important for me as it means lots of people coming together and having fun while working to help the community and the environment. I'm doing my part by working on using fewer resources at home – turning off everything I can, using less heat, using less water, re-using more items, making things myself instead of buying, etc. Love the "Freeze Yer Buns Off" challenge! Oh, and I did all 3 of the extra items – follow, like, and tweet! I did a recylcing project with my son to celebrate Earth Day! Love these fabrics! As simple as it is, Earth Day is special for me because it is a day that the global conscience is all about our home and preserving it. I want to make a difference this year by not drinking bottled water anymore. I am a follower and I'll get my mother hooked too; she loves quilting. About to like it all on FB. well I only just found you thanks to Ink & Spindle and now have ANOTHER site to add to my ever-growing fabric obsession. Oy. Am loving all of it, the new ranges especially! I'm now a follower and a 'liker' on Facebook. Thanks for the giveaway! I'm using this Earth Day as a reminder to take stock of my daily habits–using reusable shopping bags, taking a cup to work instead of using styrofoam. Little things that hopefully add up! Thanks for the chance to win your fabulous, eco-friendly fabric…which I LOVE!!! The prints are just so amazing! Earth day should be everyday! I try and make a difference in any way that I can every day, but today I actually got to take my daughter's entire kindergarten class on a nature walk for fun AND to pick up the garbage that people had left behind. It was a great opportunity to talk to the children about why it is important to keep our earth clean and our bodies healthy. Kids are like sponges and the earlier they learn, the more they are aware. It was a great day! I have a huge stack of my hubbys old golf shirts that I am going to cut up as PJ pants/shorts for my 4&8 year olds. Thanks for the giveaway! I teach high school German and will definitely raise awareness for all of my students. We are having an Earth Day poster contest. The unit we are focusing on right now is the environment. I love teaching a topic that I am pesonally passionate about! Thanks for the awesome giveaway! I am so excited to see more companies with organic fabric. What a great step forward. I'm remembering my reusable bags, composting and spending more time outside this week with my children by taking part in TV turnoff week. I love that Earth Day truly has covered the gambit now. I write a wedding blog and am making a conscious effort to make my wedding eco-friendly and trying to reduce our carbon footprint. P.S. My wedding is where I would use these fabrics. I love making fabric flowers! Earth Day is going to be super special because this year I took my three year old to a recycling center and he learned all about reducing, reusing and recycling! Earth day and every day – try to grow my own food – clean my chicken coop, add it to the garden, improve the coop, start some plants, learn more about growing, try to buy things without too much packaging, try not to buy things, recycle, recycle, reuse and recycle. Sadly I haven't found a way to get away from driving a car…. The new collections are wonderful! Loving the colors- and themes. Too cute! I am now a follower on the blog. And I just liked you guys on facebook. Gorgeous fabrics!!!!!!! I love the fact that I will be contributing to make a better future for my children and grandchildren on earth. It gives me time to spend gardening our organic plants together too. Earth Day every day! always have a cloth baggie in my purse and plenty of tote bags in the car. And I love running recycle clubs with kids – trying to get the next generation involved and hoping they'll have some influence on their parents! Being a teacher, the best part of Earth Day is teaching the next generation about what we can do for the earth. I'm totally a blog follower. I hope I win! I'd love to use the fabric in my recycled military uniform bags. I absolutely love all of your designs!! Every Earth Day I plant a tree, but I try to make a conscious effort everyday to be less wasteful. Love these fabrics! I'm not religious, so I love earth day because it a holiday I can believe in – celebrating our earth! I've been trying to come up with some sort of Earth Day tradition to do with my son. I love Earth Day for 2 reasons, the first being the obvious, but the second, for the creativity that it evokes from so many people who recreate beautiful things from what otherwise would be tossed away. Thanks for the chance to win your fantastic fabric! Tomorrow I plan to take care of the Earth by doing the little things I am trying to make routine; unplugging things that aren't in use (TV, computer, mixer), putting on a sweater instead of turning up the heat, turning off lights, not running extra water. If I can make these things routine, then I can really make a difference. I already liked you, but now I do on facebook. I love all your lines! Perfect for my little man! We are being "earth-friendly" by cloth diapering our little guy. What an amazing giveaway! Fantastic prints! Earth day is special to me b/c I like to teach my kids how to 'love' our earth everyday. What an awesome Earth Day Giveaway! Tomorrow I'm going to celebrate by planting organic vegetable seeds on my porch in compost from the worm bin that I use to keep my food scraps out of the landfill. I love these collections! I am committed to using recyclable bags. After reading of all the plastic in our oceans I swore off plastic grocery bags. Bringing our own bags must become a habit! yay! earth day is special to me because i am a preschool teacher and sharing nature and teaching about it with them is amazing! i will do more recycling ! Earth Day is a chance for us to even out some of that bad karma and do something nice for the earth for a change. It's a reminder to us that it *does* matter when we go to the trouble to recycle that bottle instead of putting it in the trash because it's easier. This Earth Day I think I'll try to talk my boss into doing more recycling at work! Thanks for the giveaway — the fabric is so adorable.! I'm making a difference today (and every day!) with our new solar panels 🙂 Thanks for hosting this giveaway of your beautiful fabrics! Earth Day is always a special day for me, because I work with children birth to five years. We plant seeds, walk barefoot outside, feel the sun and breeze on our skin, and smell the dirt. We pick up special rocks, admire and smell daffodils blooming, feel the rain on our faces and stomp in mud puddles if that's the weather. We compost our food scraps and unbleached paper towels for our garden. We recycle our yogurt cups. We listen to the birds call and find tiny insects in the grass. I know how lucky I am to see the Earth through the fresh eyes of children every day. Adding you to my Google Reader – I'm Circa 60 myself, and *loving* the new line!! Thanks for a great giveaway! I like Earth Day because it gives me a chance to advertise more openly about being green. My co-workers will recycle & it's an excellent marketing opportunity. Earth day is special to us this year, as my husband is in a line of work where the banks want him to throw everything in the dump. He has worked hard, and hundreds of extra hours to make this process more earth friendly, finding ways to recycle, or give these items to those in need instead of heaping them in land fills. Insteaed of letting the government run banks take a back seat approach, I admire him for going the extra mile and educating his clients in other ways of doing "business as usual"! I am a new follower too! 🙂 Just found you through fabricworm!! Earth Day is special to me each year because i always plant something on that day…it may be in a pot in my house but it is a small celebration for mother EARTH! Earth Day reminds me that even the little things (like remembering to turn the lights off when i'm not using them) are important! Thanks for the great giveaway! I'm super excited for the circa 50 collection to arrive! I'd be even more excited if I won them in a giveaway! I'm also a new follower of your blog! I try to practice being nice to the Earth every time I go to the store. I consistently use my reusable bags instead of plastic. I am very proud of my small contribution. I also try to spread this idea among my friends. My daughter is doing this, too! I have tweeted (@mainelyhome). I "like". I "follow". I really do think Earth Day is everyday. My husband and I both work in the enviro world — and met doing so. We love this planet. I'm celebrating this year by getting away from my screen and breathing fresh air. Earth day is special because I live in Oregon, one of the most beautiful places in the world. I would like my children to have beautiful places to grow up in. I tweeted about your giveaway! 😀 It is one AWESOME giveaway! Oh, what a lovely range of fabric! Earth day is a day to reflect upon what a gift this planet is and how we should look after it. I had trouble with your Facebook button, but I looked you up and now I "like you on Facebook as well. earth day is important cause my kids should be able to enjoy a swim in the ocean without worrying about what else in there.we are teaching them even small things cant make a difference. like drawing on old envelopes and . Earth Day is special to me because as a new mom I am being even more careful with how I treat the earth… knowing I am leaving it for my daughter… and future generations. I am trying to be smarter with my consumption as well as my waste… so I love "green" products! I "like(ed) you" on FB. I'm into recycling old (and often ugly) crocheted afghans into beautiful ones for baby charties. Earth day should be everyday… respecting our planet will enable a future for our children! I appreciate Earth Day because, in the event that my (already grown) children, ever provide grandchildren for me, the earth will be a healthy place for them to live. One way I honor the earth is by wearing handmade shoes, made with recycled conveyor belt soles (from Native Earth Shoes). Earth Day reminds us that the green of nature is most important in our lives. Earthday is important to remind us to think about the future and the world we live in. Guess I need to go and sew another morsebag today ! hola! estoy conociendo su blog gracias a este concurso y la verdad es un placer! ahora mismo me voy a hacer seguidora y en face tambien… tweeted… no tengo! seria genial tener esas telas organicas y con diseños originales y preciosos!!! la chio desde cordoba argentina! 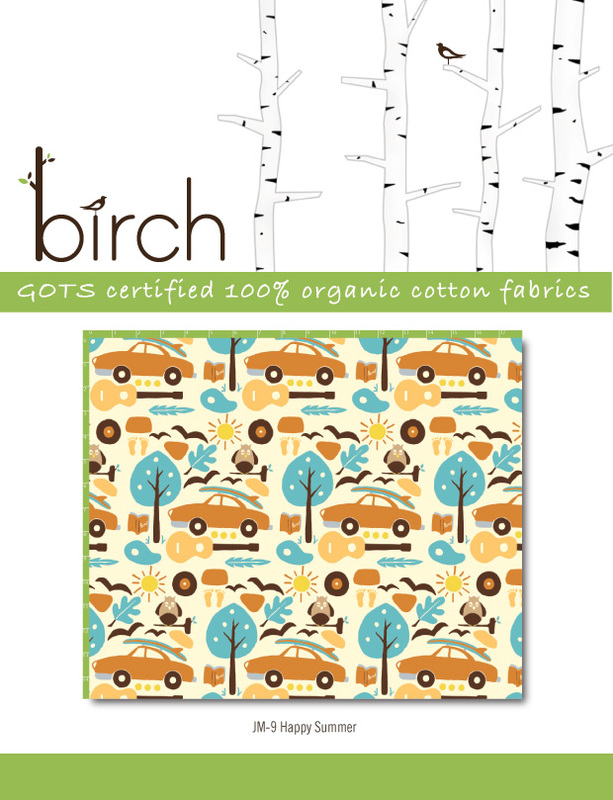 You are now following birchfabrics ! Awesome ! loVE The Circa 60: Beach Mod fabric!!! Road trip!!! I'm following and loving you on FB! I'm a mom of 3 a S.A.h.m I'm trying to do all things to not leave a larger footprint than needed. My 3 children and my awesome hubby want to live responsibly. My family together will be volunteering on Earth Day to help our community make a commitment to reducing our damage to our planet. And I like you on facebook too ! I want my kids to inherit a beautiful, healthy world so we are trying to recycle and use organic products when possible. I love your fabric, I have to hunt down a reseller in Germany! I also follow your blog now! I love your fabrics! The new ones with whales are sooo cute! Thank you for the chance to participate in this giveaway! And Happy Earth Day to you! i love the marine prints!!! well, i commute to work on foot, and try to do my bit EVERY day, not just once a year. I'm new and happy follower! Happy earth day to all. I try to always use glass instead of plastic, recycle, use less paper products (including plates….wash a lot of dishes). Hopefully we can turn this wasteful generation back around! What a fabulous giveaway!! I normally use recyled fabric for my projects but 100% organic is great too. For Earth Day I'm going to do what I do EVERY day and try not to leave a negative imprint on the planet. Earth Day should remind us how much power nature has and that we are a part of it. I tweeted about it. Happy Earth Day to you! I try and do my best everyday so earth day isn't just one day where I do stuff differently. I so plan to quit early today and just be outside in teh sunshine. It is actually not earth day that is important but every single day on which one should make a difference. Earth day is a reminder that we shouldn't just destroy everything around us but rather live with it. And even though it is not an easy thing to do, earth day is a great to rethink my priorities and do a lot more for my environment. Thanks for the great giveaway! I guess I'll do today what I try to do every day, like going to the groceries store with the reusable bags I always carry with me, or put tap water in my cute Orla Kiely bottle :). I've always felt they should all be Earth day, really, but it is important as a reminder. Also, I'm a mom now, and more in tune to teaching opportunities. Next year, we will plant a tree together. Today, I am recycling some of her outgrown baby clothes and my old, busted-up maternity jeans into a heavy duty quilted rug for taking her out to the park. Also, I'm sowing herbs on the windowsill. I forgot to say how taken I am with Circa 60. That meadow print! I am becoming a follower, love to see the fabric in use. Am totally in love with your new range. Am now following you here & on facebook. Earthday is important as it reminds us that we should look after our planet for future generations. I will be celebrating by planting more seeds for the graden and doing some recycling. We spent the day in a park, running through the grass, playing frisbee and enjoying mother nature before the weather becomes to wintery. My kids live in hand-me-downs, we always use both sides of paper and recycle the paper (and everything else) when it's ready to leave our house. Earth Day is now more important to me because I've become a countryside walker, and the greens of England don't exist anywhere else. We should work to keep the green alive for future generations to go walking in and breathe the fresh clean air. It is important because most people don't care about what's going on with our planet. And to have at least one day to think and care about it I think is a great start. This year I am going to a park near my house and enjoy those beautiful trees and flowers. I am walking instead of driving today. I love the way the schools make such a big deal of earth day and the kids get so excited about it. We try and find special activities in our area and go participate in something with them. My son would love those rocket ships and cars! Done! Thanks for the great giveaway, I hope I win! Your new fabrics are beautiful and I can't wait for them to be available. Congratulations!! Lovely fabrics. They make me want to go outside and just live there everyday. Happy Earth Day! I'm a HS teacher, and walked to school today! Would love to have your fabrics to make some project bags for my knitting friends! today we are planting our sunflower seeds and picking up trash around the neighborhood…again. its up to all of us to take care of our earth. Earth day is special for me because I know I have the opportunity to talk/teach about the importance of the day to my students (I am a traveling teacher). What lovely fabrics. Yer killin' me! Every day should be Earth Day. I want to be more aware of keeping our environment a good place. Even with little things. I celebrated Earth Day by having lunch in the park near my office. Love the new prints! Love these fabrics! We've recently installed solar panels to heat our hot water to reduce the amount of electricity that we use. We heat our home using a wood boiler so that we don't have to use oil and I'm also putting in a large vegetable garden this year so I can grow my own veggies and freeze what we don't eat so we can have them over the winter months. Every day is earth day in our house! Earth day is special to me because it reminds me of the beauty we are surrounded by and how we have to take care of it. I have started using a water bottle at work instead of using paper cups! Every day should really be earth day- that's the way that I look at it. What makes it special is just the overall awareness to make the planet better- even if for one day. You are in my google reader feed so I am a follower! Hi, Earth Day is special to me because it reminds me of my college days when I first learned of it. Today I'm going to use less gas by riding the bus to and from both of my jobs today. I've also "liked" birch fabrics on facebook, the designs are wonderful! For Earth Day today, we are working on our yard. We are pulling up the plants from the front of the house (that the previous owners planted) and rearranging them in the back of the house where we can enjoy them more. We'll then be planting new things in the front. Today, as usual, no lights on, no TV on, and I will go clean up my "adopted" park! I love Earth Day, you can visit my site and see why. . .
We are doing a giveaway too of over 40 fabric bags. I twittered about this and liked on Facebook. The fabric is gorgeous! Love the giveaway! Happy Earth day! Earth Day is special for so many reasons, but number one is my kids! We reuse and recycle whenever possible. Mother Earth has given us everything we need, how can we possibly ever thank her enough, lets celebrate a healthy planet for all species! Earth day is an extra opportunity to teach the young and remind the older that we have the responsibility to care for the earth and all it's living creatures. Our part is to reduce waste, and make choices that reduce or eliminate toxins and pesticides. Let's enjoy the beauty of nature ! Eath day is important to me as it reminds me what is important in life. I love feeling part of the natural world. I did my part by planting a tree in our garden. We live on such a beautiful planet, and it should be Earth Day every day. I try to re-cycle as much as possible, and encourage those around me to do the same. We should also teach the rising generation to appreciate and respect the environment by not littering, and not defacing our natural surroundings. I would love to get the chance to use such beautiful fabrics. Earth Day is just another reminder of the awesome power of God. Yes I'm a follower on blogspot! Thanks!!! earth day is special because it reminds us all that the earth needs us as much as we need it to survive. i wish more people would help take care of it!! Every little things count – we have been switching off all switches to the TV/DVD/cable/microwave oven/kettle/fans etc etc Today I was clearing the girls dvds and i was going to chuck all the plastic covers when i realise these are all recyclable, too. So downstairs they went to the light-plastic recycle bin. Yay! Earth Day reminds me how AWESOME God is! I like Earth Day because it focuses our attention on our planet's needs. Today I'm helping the Earth by running a large library used book sale, which both reuses many books and keeps them out of the landfill. I've been admiring the Circa 50 collection and waiting for it! Earth Day is the essence of my job, but EVERY day. I work at a Quaker school that has great interest in environmental sustainability, in fact, I'm in charge of maintaining our membership in a lot of the sustainability initiatives that we have joined. I also happen to love sewing, of which numerous kids are familiar. Instead of just recycling old clothes to refashion into new ones, I'd love to be able to create several outfits to show the kids that "crunchy" doesn't have to equal drab and that sustainable doesn't have to mean old and pilly! Thank you so much for making organic offerings for quilting. It's a disappointment that so few have existed until recently. To answer your questions, yes I'm a follower. I don't do Facebook or Twitter or so I haven't become a fan or tweeted about you. Sorry. Earth day now has a new meaning to me since i have children! I would like for my daughter to grow up in a clean healthy environment….! In honor of this we have started recycling in my office at work! woohoo! became a follower and liked you on facebook! i love this earth day for all the new blogs i am finding! …and you've been tweeted! Thanks again! Today I am beginning some long overdue projects in the yard to make it more appropriate for this climate. It will never be watered again! ooooo… I'm a follower of this blog already! I love these fabrics! Earth Day is an important reminder to all of us that we are the stewards of the earth and that we need to take care of it for ourselves and future generations. Today we will go on a walk and reflect on the beauty around us (especially with all the flowers in bloom!). Yay! earth day is everyday really for us. We eat little meat, reuse anything we can, use reuseable shopping bags & don't use paper towels. I am planting herbs today for Earth day. Earth Day is special to me today because I'm taking care of three little ones, and I'm excited to teach them all about it. We're doing some composting and making art with recycled materials. Tweeted! i love these fabrics so much! earth day is special because of the collective energy so many folks put into our beautiful mother on this day. however, i believe we should celebrate the earth every day and continually find new ways to ensure a long, long life for her. i take as many opportunities as possible to share the magic our earth gives to us with my children on a daily basis. Earth Day is important to me to remind of how every little bit helps – we all need to work together to save our planet. The way I'll make a difference is teaching my children about the importance of reducing and reusing and hope that they stpread the word as well. Circa 50 and marine prints are fantastic! I would have a hard time choosing for a little boys room! I just became a follower of birch fabrics. today we are focusing on teaching the kids more about what it means to recycle…. I'm following you! LOVE the fabric…nice! The special thing about Earth Day for me is all the hoopla! It helps increase awareness and importance of bringing our lifestyles in line with supporting a healthy planet. What I plan to do is add another earth-friendly habit to my daily routine: Purchase power strips and turn them off before bed at night or when not in use to save even more electricity. I am a follower as of today. I feel very strongly that we should take good care of the earth. I live in New York City, and I am constantly appalled at the way people treat the environment here. My husband and I find ourselves picking up trash off of the street whenever we see it, removing dangerous items from the sidewalk, like broken glass. This weekend our church is hosting a neighborhood cleanup project, which my husband organized as a result of the trash that litters our streets. I will definitely be participating! Earth day is important cause is part of us. If she dies we dies too. earth day is special for me, because it reminds me to think about our responsibilities in preserving our environment, and to talk about those things with our kids. we celebrated earth day by picking up several bags of trash in a nearby lot. today we're also going to make a trip to a local nursery. thanks for this great giveaway! One quick look and I"m a follower. Love it!! And the name. Love Birch trees. I love those fabrics, I would love to make a little boy quilt. I am now a follower of your blog and liked it on facebook! Not just Like on Facebook, I Love. I try to think about the Earth every day, but Earth Day is a good reminder of how important eco-friendly habits are. Today I am attending a class on how to safely ride your bike to and from work! Our city is having Bike to Work day on May 4 so I need to practice and learn how I can be safe and not drive the car so much around town! I'm a friend of FB! Thanks for the awesome chance! We like to pick up trash around our neighborhood while taking walks. It's a great way to keep things looking nice while getting some fresh air. It sounds cliche, but every day is earth day at my house. we're growing food (though working on growing MORE of it), planting trees regularly, making things from scratch, recycling, and we live off grid. The fabrics shown above are so beautiful. I love that organic fabrics are bright and beautiful! It seems like a normal day to me – at home, we do our best to recycle (we recycle more than we trash) and do simple things like use CFL bulbs and bring our lunches in reusable containers. Even small acts can have a big impact! This world is such an exquisite place. I will help by teaching my children ways they can keep it wonderful. earth day lets me guerilla garden! Earth Day is special to me because it's a day to raise awareness of taking better care of the earth and I think that every year that passes, more and more people are becoming aware. Yay, I've requested to be birchfabrics to be my friend on FB. Love the Circa 60 line … my son will go crazy when he see it! Earth day is special because we always pick up garbage/park clean up on earth day (and when ever we see it) and it's a good opportunity to talk about respecting mother nature. If only I weren't stuck in an office all day, I'd be out enjoying nature today. Earth Day is special because in the middle of all of the noise of daily life, it reminds me to reflect on just how wonderful and beautiful nature is. I'm going to carpool with my husband to work! On this Earth Day, we will continue to compost even more of our fruit and vegetable scraps. I've been trying to slowly convert everyday into Earth day…from the foods I choose, to the fabrics I live in. This sounds so school yard it makes me smile. Earth Day is special for me because I started celebrating on the very first one in 1970. Thanks to David Brower! And thanks to Birch Fabrics! Earth Day is special because it reminds us all of the ways we can be more eco friendly on a daily basis, and why we need to be! It's also a great time to look back over the previous year and see the changes you've already made. For Earth Day (and everyday) we recycle! Paper, plastic, aluminum, and I repurpose clothing for sewing projects. Liked you on facebook as "rjcharms"
What makes Earth Day special for me is doing my best to behave for the rest of the year as we're all encouraged to behave just this one day. Earth Day is special to me because I've always been an ambassador for the environment. And now that I have a baby, it is that much more important to me to live in an eco-friendly way. I have made a conscious effort at work not to print out anything today. And I am now a Follower and "I Like" on Facebook! Earth Day is special to me to see the appreciation fostered in my children. My 6 yr old daughter was happy to announce that we help the Earth by walking to school. She asked if we could plant a tree so we will do that today! My 2 yr old son will enjoy digging in the dirt too! I would like their generation to be able to enjoy the beauty, peace, and awe that nature has inspired in me! For Earth Day I organized an event at Guadalupe State Park in Texas with twenty different nature oriented presenters. It should be fun! It's Saturday. I hope I win this giveaway more than any of the other ones! I always go yeah for Earth day because I love trees, I just love them. And what I do everyday is use cold water for my laundry, never hot to help save energy and use a great locally made non-toxic, biodegradable laundry detergent. Love that Mod Beach line! I try to be 'green' everyday, but Earth Day is a good reminder to get back on track with some of the things I may have started to get lazy with… like using reusable containers for snacks and lunch instead of plastic bags. I love that whale fabric! I am hoping to plant a lemon tree today! Earth Day is just another day dedicated to a better awareness of living a more sustainable lifestyle. We don't want our kids to be punished for our mistakes and it makes for a healthier community and healthier world. I am going to recycle and use a reusable water bottle. No more plastic bags either! I volunteer at a community centre fruit and vegetable garden and encourage all the children to get involved. I am especially pleased to work with kids who have no outdoor space at home. Like many others have said this is my Earth Day every day. I wish every day was Earth Day! As I get older, I get more and more concerned with the way we poison our environment. Earth day is everyday in our house, but for the last 4 years I have plant a special tree/plant on this day. What amazing fabrics you have and it is so nice that they are organic too! earth day is special because clean air is so essential for general health! Gorgeous gorgeous fabrics. I've become a follower but can't facebook or tweet as I'm on neither of those! Earth day is important to me, because it reminds the people over the world to stop for a moment and reflect on our beautiful world. I strive to make choices daily that have a smaller footprint or a non-toxic alternative to the 'norm'. Earth Day marks a day to enjoy God's colorful creation…and think about ways to be good stewards of it and all it has to offer! I love Earth Day. I love to swim in clean water and enjoy shade from healthy mature trees. I hope my children's children someday will enjoy the same pleasures. Hi – Today I'll be cooking a meal with some local ingredients–which can be a challenge here in Alaska. Earth day is special to me because it gives folks a chance to stop and think about their own impact on the earth. Also–I tweeted about the contest, AND "liked" you on Facebook, AND began following your blog. Thanks for doing the contest! I think I will make some of my own household cleaners for Earth Day! DIY and ecofriendly! I love these fabrics….yummy!!! I am letting containers collect the rainwater, and we are getting ALOT of rain!!! I love taking care of the earth God created for us to live on!!! As a family we always recycle, and look for any ways to reduce our waste. i reuse clothes, pass them to my next children and i even love buying used stuff that are in good condetion- clothes, furneture..
Earth Day is special to me because I now get to "see" it through my daughter's eyes. I already replaced most of the light bulbs in our house to be the energy efficient bulbs, but completely forgot about my garage. Last night, we replaced all of those. I'm a big fan of recycling as it is but I made a trip to the grocery store to recycle older plastic bags and have only been using my re-usable bags. Thanks for such a fun giveaway! Oops, I started following your blog via google reader + like your fb page! Earth Day helps shine light on the health of the Earth, which all too many people don't think much about the other 364 days of the year. Hopefully each year more eyes will be opened all year round. Lovely fabric!! I try to make everyday Earth day for the future of our earth! Earth day is important because it reminds everyone about the importance of being good stewards for this planet we live on. It helps people who never think about things like reduce, reuse, recycle think about it for one day. Also I love the new lines and cant wait to see them in person! I will be planting seeds with my two year old today and we'll be talking about things we can do to make a cleaner, better world. I also joined your Facebook page. at our house, every day is earth day! but, today is special because it is internationally recognized and global focus is on protecting our delicate planet and all of it's ecosystems for one whole day! i love your fabrics and shouted it to the world on twitter and facebook. Keep up the good work!! It's a gorgeous day up here in the Pacific Northwest. When my husband gets home from work, we're going on a walk with our two little boys. We'll bring our magnifying glasses and examine trees and plants and rocks, and maybe bring home a few things we find on the ground to make a nature centrepiece for our table. Earth Day is special because we really should make sure to love the earth every single day… but having one specific day to celebrate and make new changes… well it's kinda like a new year's resolution time. My favourite thing about Earth Day is that it brings everyone thoughts back to what makes our lives possible. Earth Day can be fun for the more genuine gatherings. I have the make everyday earth day mind set so the day is nice to see newbies be exposed to something new and get together at planned activities with friends. Just became a follower and discovered your blog. Beautiful fabric! Earth Day is important to us not just today but every day! I am trying to use the car as little as possible. I love earth day because it's a day that I can feel like there are other people fighting the envionmental fight along with me. Today I'm working with no lights (I have a big window) and I am eating vegan. Earth Day is a great reminder to me that we are only on this planet temporarily and it is important we take care of it while we are here! I try to recycle as much as I possibly can and am trying to cut down on the amount of discarded packaging I use. Like News Years Day, I think Earth Day is a great time to re-assess what I have been doing (or not doing!) throughout the year to live in a way that takes stewardship of the earth seriously. Earth Day reminds me of what a beautiful place that I live in and how much I want to keep it that way. As a hotel interior designer I work with my clients to bring them innovative design with an earth friendly approach so that future generations can enjoy this beautiful planet too. 12 fat quarters! WOW! Count me in. Earth Day is so important to me because by celebrating it and sharing it with my son i'm cultivating in him a love for his home! and teaching him to be a good steward with what has been given to him. Very important lessons! Each day seems to bring more bad news about how the earth is suffering from our abuse. It's nice to have a day to stop and recommit to being green. Every day should be earth day. Earth day is a good time to sit back and think about the natural elements that make things beautiful! today we are planting trees in honor of earth day. We have been wanting to do this for a while so the kids are excited, the tree hole was dug on Monday so now they're ready to help daddy tonight! Love the new lines! Can't wait till they come out. Our playgroup cleaned up a park today and at home we always use cloth towels instead of paper. I'm spending Earth day cleaning house w/ non-toxic cleaners & working in the garden (okay, I'm on a short break right now!). I walked and carpooled today! Love the fabric! I am a follower… What great prints!! I would put every inch to good use!! I "like" on Facebook!! I have to try these out! My son would fal in love with these prints!!! Today I used my fabric bag from green bag lady instead of plastic. Earth Day is a gentle push for everyone to take a step back and actually pay attention, think, take action. We need a lot more than a gentle push, but it's better than nothing! earth day is special because most of the people in the city don't know anymore what nature is . And it's good that they get aware of nature. Earth day is important because my 5 year old daughter says so…I'm under strict orders to not turn on any lights while she's at school…And to plant our garden. And I LOVE the fabric with the campers on it…wonderful! Earth day for me is like any other day. It might sound cheesy but I try to make every day earth day. I recycle and upcycle as much as I can. If I can't recycle an item I try to re-use it in some creative way. I'll be using the fabric for, hopefully, a dress, a shopping bag, a grocery bag, and the list goes on and on! Earth Day is just one more way to remind me of how blessed and grateful I am to be a part of this beautiful world… especially in the USA. And, how thankful I am that my sweet husband planted an organic garden for me, for us, four years ago! Thank you for this opportunity to win some of your lovely fabrics! And now I am a follower, too! Earth day is special for me because it's raising awareness of things I do "everyday". It excites me to no end to come up with new ways to love Mother Earth! Your fantastic fabrics are also super exciting and would look so cute in my living room! I would love to win this fabulous give-away bundle. Earth Day is important to me because it's a day where I can stop and thank God for creating this beautiful planet we live on. My email is sarahpead@yahoo.com. Hope I win! These prints would be perfect for baby items for the little one we're expecting. what makes Earth Day special for me is that it's also my sister's birthday! i'm going to make a continuing effort to recycle as much as possible and to buy resale. I think that Earth Day is the perfect opportunity to show the world our concerns about environment and especially how everyone can change a bit their habits to live a more eco-friendly life. I try my best, even though I can still do better! Whenever it is possible I leave the car at home and walk or drive with my bike, at home we have special bins for garbage (so we can separate paper from plastic, etc.) and I make little projecta with recycled materials for me and my friends (for exemple I decorate frames with pieces of broken cds, I make pouches from old billboard I get from the cinema I worked for, etc.). Sorry for the looong comment! I hope everyone will treat our planet with care for the future generations! Ah, I almost forgot! With the fabric I would like to make a little shopping bag and/or some pouches/dawnstring bags! Earth day is special to me because I feel connected to nature and everything I can do to help restore that connection makes me a happier person. I love the idea of eliminating unecessary packaging, it's one less thing standing between me and nature. When shopping for products I always consider the amount of packaging before making a purchase. For Earth Day, my friend and I decided to carpool to work today and I am using my reusable mug at work!! I LOVE these fabrics you are giving away and this collaborative effort is phenomenal! Thanks for a chance to win! I am a follower of Birch Fabrics (Sandra Chang)! Thanks again! Earth Day,,, I feel special knowing that ONE person CAN make a difference! I pre-cycle and shop accordingly, switched most of my tupperwares to glass and try to recycle everything possible. oh yeah, I'm a follower now! And I'm a big recycler and walker and eat plant foods almost exclusively…all things that are great for the environment! My students spent the day talking about Earth Day, its such an interesting thing to listen to them and their opinions. I always like to plant something new on Earth Day – this year it was 2 new-to-me heritage variety tomato plants. Yum. Love your fabrics!! Especially the space ships! On Earth Day I spent some time upcycling some clothes, where other people would have threw them in the trash to go to the landfills. Earth day makes me think how the internet has helped lessen the use of paper. I never buy magazines anymore, cause I find all the inspiration I need online. I'm trying to recycle packing materials. I make mailing envelopes out of large, empty cat food bags. I just turn them inside-out, spray wash them and stitch them up on the sewing machine. I am now following your blog and have shared your link on Facebook. Earth day is special to me because it's a time to reflect on what you are doing to make an impact on the world around you. I can't say that I'm doing something particularly different today, as we try to make each day more environmentally friendly, but I'll say today we are making a point of printing on both sides of paper! I'm of a certain age where I'm thinking more of what kind of world I'm leaving my son, and what ever grandchildren I might be blessed with. I try hard to be conscientious each day, but Earth Day is like New Year's Day. It's a time for reflection and renewing a commitment to doing the right thing. It's a day to think, "What else can I be doing? What new habit can I adopt that might help the planet?" Earth day is special to me because it represents how far our society has come; recognizing the need to change, and believing in a sustainable future. Today I am making plans for the planting of my new fruit and vegetable garden! This summer I will have homegrown, fresh and local foods to eat. Hopefully more people will have this option to eliminate the pesticides on their food and in the soil and reduce food production associated GHGs. The garden will be a quiet place for inspiration. earth day is special because it's my anniversary. 10th this year! i make a difference every day by using cloth diapers & recycling even the smallest bits of paper i find. Wonderful giveaway. I just became a follower. Earth day is a reminder that we should be good to our planet and in return it will be good to us. Earth day is particularly special this year as I my daughter is now old enough to understand the celebration of our precious Earth. We turned off the lights, grabbed our rain gear and went out for the drizzly day to jump in puddles. Then we made bark boats from our great treasure finds and played all afternoon. Earth Day should be important to all people all over the world. We need to take care of our planet so it will be around for our children and their children and for years to come. I recycle, reuse, and repurpose everything I can. I also use 100% cotton and batting in all my quilts. I love this fabric too! Happy Earth Day! Thank you so much for offering your fabric for such a special day. I will teach my grandson (3 yrs.) what it means to be Green and appreciate Mother Nature. Oh my! !Those are some CUUUUUTE fabrics!! The thing that makes Earth Day so special for me is how excited my boys get about "cleaning up the Earth". I love Earth Day because it reminds me to keep making small changes to how we live. Thanks for the giveway! Earth Day is a wonderful day to celebrate our planet – but I try to treat every day like Earth Day and to tread lightly in all that I do. One of the things I do is to make as much clothing etc as I can. Your fabric is gorgeous and I can think of many projects to use it for!! We vote for the earth with our mouths around here, we are trying to make most of our food, and can't wait to get that garden going! Today we bought a peach tree to plant. Every year we try to buy and plant a new tree. I am looking forward to harvesting my own fruit to feed my family. I am hoping to make some reusable bags for the grocery store. I also just started following this blog. I love earth day, not only because it's the day before my birthday. but it mostly like that it seems to bring awareness to how important it is for us all to work together to better our planet. Earth day inspires me to start my garden planting! I tried not to buy anything today and I picked up garbage wherever I went. Thanks for the giveaway! Such an important day!!!! I just love the new fabrics! THe colors are gorgeous and they are organic!!!! Yeah!!!! Now I'm a follower of your fabrics!! I'm so glad I found your site — can't wait till marine comes out!! Earth Day has been even more special these past couple of years because I finally have a house with a yard and am learning more about gardening each day! Eating pickles you made yourself from cucumbers you grew yourself is the BEST! We need to take care of our planet for our grand and great grandchildren. I make childr4en's clothing from clothes we no longer wear. I am hanging out my wash to dry on the umbrella clothesline I got off my local "Freecycle". earth day is a day to do the things in the dirt i've been meaning to do for weeks. i'm finally putting my garden together! peas and tomatoes and herbs! i also gave my lovely bicycle a wash – all that commuting gives her a nice layer of grit. i've ridden her to work every day since the beginning of the year. Earth day is special to me because I'm becoming more aware of how I can be more green. I'm trying to grow some of my own vegetables this spring. I have been making lots of small changes in my life to help the environment. I always bring reusable baggies and containers for lunch. I try to do as much shopping as possible at local stores. I bring bags with me when I go shopping. I belong to a CSA. You're fabrics are lovely! Earth Day is special to me as I recall being in NYC for the very first Earth Day in Washington Square down in Greenwich Village. I was in the apparel industry then and the rage was "man made fibers." I am so happy to see organics gaining in popularity now. I just became a follower on Blogger! What lovely fabrics you have! Earth Day is fun for us because my hubby is a zookeeper. The zoo has a month of fun activities that our daughter is just now old enough to like (21 months). i try to live an environmentally friendly lifestyle everyday and make as many eco-conscious decisions as i can ALL year around, but i think Earth Day is am important day to honour Mother Earth, create awareness, participate in community events and celebrations, make extra efforts like planting trees, and renew commitments to the earth and the environment. happiest of earth days and thanks for the lovely giveaway! Earth Day ties together so many themes I ascribed to: eat and shop local, sustainability, ethical tourism, recycling, creativity, and on an on. Earth Day is important because it makes people think about the environment more than they would have otherwise. I try to do whatever I can to make a difference like re-using "disposable" items & conserving energy and gas. Most importantly, I try to pass on my ideals to my children. I'm celebrating earth day by planting some vegetables! Lovely, lovely colors in your fabrics! I actually try not to treat Earth Day as special – I try to be conscious of the environmental impact of my actions year round and celebrate seasonal events rather than a particular day. Today I worked in the garden, and I think it helps make a difference to grow our own food. I live on a farm where conservation is key to sustainable agriculture and making a living. Every day is Earth Day for us. We recycle lots of items: envelopes for note paper, milk jugs/coffee containers for gardening/composting , plastic bakery trays for kitchen, lightly used wrapping paper/ribbons, pass along plants, rooting plants and trees from cuttings, manure from the field, family garden (then turn cows out into the garden once is finished). We have lots of items made from reclaimed "stuff" from the dump. And, we save all our fabric scraps for quilts. Organic gardening goes along with organic fabric! Love it! Those fabrics are too cute, i hadn't heard of your fabrics until now in this contest. I might just have to become a follower! Every day is the day earth, but today, with my child celebrate with flowers! Earth Day has come to be a lot more special to me, now that I have a little boy whom I'd like to be able to enjoy nature when he gets older. And, I've become a follower. And I've hit the "Like" button on Facebook! This is the first year my son has really understood the importance of "doing something for the Earth" so I've enjoyed seeing things through his eyes. I was very proud when he decided on his own to clean up some trash at the playground. We do have a pretty pretty earth, let's celebrate it. I rode the bus to work today instead of driving. Great new fabric lines. Thanks for the opportunity to win some fabric. Oooh! How exciting! I LOVE your fabric. Earth is important to me everyday but I think Earth day is important to make everyone aware that they need to take care of the planet. Today I went to work on the subway (like I do everyday!!). Oh, I do like you on Facebook. 🙂 And in honor of Earth Day I walked to all of my errands. It was such a joy to spend time outside- a great reminder of why we all need to do our part. We volunteered at the celebration put on by our community garden. It was a blast! Today I worked outside cutting/recycling fabric t-shirts to make reusable grocery totes and scarves rather than sit inside using electricity. What I'd really like to do is find a way to help clean up the oceans of all the devastating plastic that is killing the sea life and choking the seas. We need to do anything and everything we can to conserve and not pollute. This is the first I've run across Birch Fabrics and I love your goods!!! Thank Poppytalk for steering me your way 🙂 I am your newest follower and glad to be along for the ride. earth day is important to me because if we don't look after the planet now, it will be too late. I am already a follower of the blog but I will add it to my Facebook because I don't think I had noticed that before. I've been doing Earth Week over at my blog. I got a hate comment today. I made a difference by keeping my cool and not replying. I planted seeds with my kids today! I just want my children to be able to live on a clean earth! I love these new prints! Every day is earth day for me. I spend a lot of time writing to legislators to try and make some real changes. I'm teaching my 2 yr old to recycle! I "like you" on facebook too. for earth day I picked up trash on a local beach…I think we all need to revere our Mother Earth more–so feel Earth day is really important! Earth Day was special to me today just talking to my 3yr old about the earth and it's plants and how we need to take care of the earth. The things she said were so cute! It really made my day. Someday she will be taking steps to take care of the earth, so I don't want to wait to tell her why it's important! Earth Day is important in our house because we are tied to the green industry… my husband is a landscape architect. We spend the day doing what we always do… beautifying our world. I'm glad we have set aside a day to focus everyone's attention on how we can each make a difference. Thanks for doing such a great giveaway to honor this day! Earth Day is a good reminder of how we should try to live our lives every day. I'm teaching a "Go Green" afterschool class, so hopefully more kids will be inspired to garden, explore the natural world and make some "green" crafts. I follow your blog on Google Reader, but now I am a real "follower" too. And I like you in facebook and real life too! I made my mark on Earth Day by taking my daughter on her first 5K run with me, and quickly discovered that an 8 yr. old can't keep pace with a 41 year old…so we took our time and collected rocks along the way! I became a follower of your blog today, love it! Earth Day encourages me to expand my organic garden where I grow fresh heirloom veggies and donate surplus food to our local food bank called the Food Share. We use wonderful fresh fruits and veggie to teach people how to cook healthy meals at emergency food pantries. Getting back to the Earth and land is so important, and it is why I teach garden enhanced nutrition to 4th and 5th grade students as well. WOW! So glad I came across this bloghop – "liked" on F/B and followed through google so I can purchase some of these cute fabrics even if I don't win the giveaway! I remember Earth Day 20 years ago, going to see Arlo Guthrie perform. (He commented that his environmental record wasn't good, then proceeded to do "Alice's Restaurant." Every day should be earth day. We have got to stop trashing the planet because it's the only one we have! The better we care for the Earth, the better she cares for us. Clean air, water, and soil are the fundamentals for health! Earth Day can set off one of the most reliably wonderful feedback loops around! I have been talking about toxics and alternatives and hoping this helps other people find their way to enjoying environmental options more. lovely!! earth day is fun for us as a family because my kids get especially excited to plan a special activity to celebrate 🙂 today it was finishing a small stash of cloth diapers for our new baby, expected in a couple weeks. my parents own recycling centers. we've always been taught to recycle as much as possible. I learned this from a very very young age. I've started making my own laundry detergent. not only do i save tons of money, but i use less harsh ingredients to clean my clothes. Your Fabrics are amazing in color and graphics ! Just this week, I have begun to use cloth tote bags for my groceries. This is no small feat – with a family of 6 and two cart loads of groceries, we were using a lot of plastic bags ! But, no more ! I am also in the process of making and using cloth napkins…. I celebrated Earth Day at my local nature center, enjoying the Spring birds. A perfect day! I am sew excited about all this new organic fabric coming on the market. Every day is Earth day for our family, but we're making an extra effort to always do litterless lunches for school. done, done, and done! all three! so happy i found your site! hope i win cos i love your fabrics! Follow you on Twitter & sent the following tweet. I love your designs and organic cotton. Being raised in Texas, I grew up amongst cotton fields. Glad to see organic is making a big comeback in fabrics. Earth day is important because I grew up in the outdoors and want the next generation to be able to do so! Today I took transit to work instead of driving! Earth day is important because there is just something so special about being outdoors with your family. Your fabric is beautiful. And yes, I'm a follower. Thanks for the chance. Earth Day is like my Christmas! In fact, we celebrate Mama Earth every. single. day. My little one is named Gaia! I just recieved a sewing machine for my birthday along with the Carefree Clothes for Girls book ~ I cannot wait to dress my little crumb in organic frocks made with love by ME! For Earth Day we planted 11 trees (yes, that's right ELEVEN…my husband went a tad nuts). Liked you guys an Facebook!! I'm growing my first ever veggie garden this year–earth day should be every day. Earth day is special, because we are responsible for the planet we live on + we need a healthy good world for the next generations. earth day is a reminder of how I should be intentional every day. I liked you on facebook. Ive never heard of Earth Day before, but since checking out this blog ive looked it up and think its a great thing to draw attention to! Anything that can make people more aware about the planet is a good idea! Im a follower of your blog now to! I also like your facebook page aswell!! i've sewn my reusable bag to use it instead of plastic bags and i'm trying to make some others for my mom, my grandmas, my aunts etc. even something so little can make a difference..
Earth Day is important because we have been given an incredible gift (our beautiful home planet) and we've been very poor stewards of it for quite a while now. It's time to change that. I'm following you and liking you on Facebook! Earth Day is important to me because my family is growing and they need a place that is healthy. We grow our vegetables in the summer, but meat that is local and share our stories with others. I also sell reusable baggies and we use them everyday in our home. I am lessening my use of plastic bags. Earth Day is particularly special for me up here in The Great White North because we celebrate it as the first day of Spring (March? March is NOT spring here?). We spend our day outside as much as we can, and do some special things for our house to celebrate the new season. Oh yes, and I "like" you on Facebook! Use my own shopping bag and use less plastic bag. Re-used or Recycle as many boxes as i can. I am a follower, and I'm liking you on Facebook! Earth day is special because it reminds us to take care of her. I rode my bike to work. Earth Day is special, but if we want to make a real change everyday needs to be Earth day. Today, I made an extra effort to make my shower even shorter, and I took the opportunity to talk to my 3 year old about taking care of the place we live. I definitely subscribed to your blog. All those fabric collections are adorable. The new fabrics look absolutely amazing. Thank you for doing your part to ensure that more fun organic fabrics are available — it's really exciting! Earth Day acts as a nice reminder to reflect on what we are already doing to tread lightly on our amazing planet, and as a prompt to dig deeper and think of what more we can do. This year, some time was spent preparing for our first vegetable garden. So much fun! Earth day is important because it reminds us of what we should be doing every day! earth day is important to me because I want to see a time when you can go to the park and not worry about trash. I have 2 kids that I am trying to lead, by example, and teach to recycle and reuse. Even an old shirt can have a purpose in the house:). Being a mom now makes Earth day so much more special. My boy helped to clean a local park and brought home a seedling to watch it grow. It's nice to see another generation getting involved… no matter how little they are to start. Every day I wake up on this planet is Earth day! I'm glad we have a sanctioned "day" however so our environmental issues can be brought into the open- remind all inhabitants of Earth how fragile our environment really is and how consciously we must live our lives day to day to protect and preserve. PS I now "follow" birch fabrics. lovely!! Earth Day is important to me because I love hiking in the woods with my dogs. Special for me because another reminder of how interconnected we are with nature. Thank you for the chance to win. That fabric is so fun! I'm a follower. Earth day is a great reminder that we should appreciate and respect this place where we live. every day is earth day over here! signed up for a local csa so will be getting yummy organic veggies all summer from a small farmer in our area! I'm not a facebook/twitter participant (no tv either!) but get my entertainment from looking at lovely blogs and sites such as yours! 1.I'm following you on Twitter. 2.I like you on Facebook. 3.I am going to go Tweet right now! 4.Earth Day is special to me because it brings awareness of environmental issues to a wide circle of people. It may spark one small change in someone which will lead to much more. Every year, my husband and I participate in a township cleanup on Earth Day. We pick up trash along our road and make sure everything is disposed of or recycled properly! I try to recycle and reuse as much as possible. I also unplug as many appliances and I can. i love it. props to you all. cheers. I love Earth Day because so many people give their Earth-friendly advice – so many blogs talking about green cleaning tips, or ways to save energy. It's inspiring, and very useful. I want a good world for my kiddos. I am learning to garden and have a new appreciation for where our food comes from. I just added you to my google reader. I love these fabrics. For Earth Day I added more organic matter to our composter. It'll be great to have our own soil for the garden! Such gorgeous fabrics! I'm excited to start using fabric to be more GREEN! A new grocery bag too and I'm planting my first herb garden this year! Yeah! I'll follow now! Earth Day reminds us all to pay attention to Mother Earth and to do our part to protect/save it. For me this means picking up garbage when I hike, recycling, limiting the use of natural resources to what I really need, remembering to use cloth bags instead of paper and plastic, and helping to educate others. Earth Day is important to me bc I want my children to grow up in a beautiful green world, not one filled with trash, and pollution, and all of the harmful things that we have inherited to them. I hope to teach them how to make their world a better place not further the damage already done. We just installed a bigger clothesline so we can dry more of our clothes in the sun and breeze! Earth day is special because it is the only Earth we have, and we better appreciate it! Earth day is a day for our family to thank our creator and to remember to do our part in keeping it clean. We also use that day to walk around the neighborhood and pick up the winter garbage. lovely give a way! i love earth day, but think it should be incorporated into our lives every day….we owe everything to our marvelous planet! so much to be thankful for! Earth Day serves as a reminder to do all the earth friendly actions we've been meaning to do, but always seem to forget — recycling, taking shorter showers, walking instead of driving, etc. We planted our garden yesterday, took the recyclables to the recycling trailer, and read up on composting. I "liked" you on FB, too! Bookmarked you under "essential craft sites to visit weekly," also. Earth Day allows us to reflect on our actions and readjust as necessary. Earth day is an important day to think about what you could do more of to save our planet. My husband and I made the decision to cloth diaper our baby, due in august! This Earth Day I'm planning to make reusable cotton bags for fruit and veggies. This will replace those awful thin plastic bags they offer you at the grocery store. Can you imagine how cute these bags would be with birch fabrics?! I just got back from a camping and canoeing trip. It was beautiful and I always want to have the privilege of being surrounded by nature. Anything to stay green! My dad has always been a part of the ecology movement and now my daughter is studying Fisheries and Wildlife in college. Caring for the Earth is very important to me to leave a clean, healthy Earth for my children and their children. We are in the process of planting for eating and canning our own food to help by being a more sustainable family. I am now a FB fan too!! Earth Day will be like any other day for me – I'll recycle, take the bus to work and not drive, turn the lights on only in the room I'm in and do anything I can to help save the environment. Thanks for the giveaway. 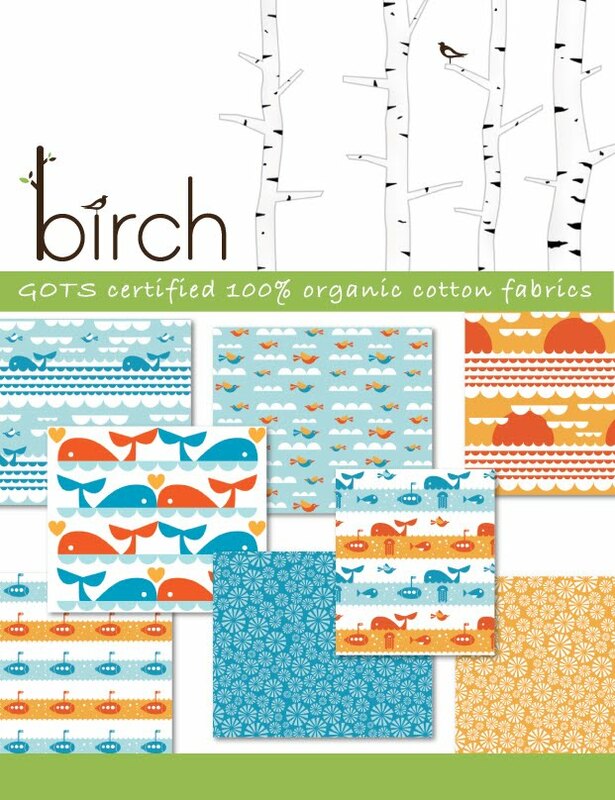 I have tweeted @birchfabrics from @ElzGrier – lovely, lovely fabrics! Earth Day is special to me not only because of our planet, but also because it's my son's birthday. This reminds me every year that I have a responsibility to raise him to care for the earth and his community – we love doing little enviro projects together like tree plants, compost box, trips to the enviro depot with recyclables we need to bring in. Earthday is an opportunity to raise awareness and team up to repair our own mistakes and those of the past generations in order to preserve our planet for the next ones. These are such lovely fabrics! How fun, thanks for the blog hop, can't wait to explore. Hello! Earth Day is a great opportunity to discuss the importance of being "gentle" on the Earth with my young daughter…hopefully her generation will take our environmental predicament much more seriously and proactively!! Earth day is special for my family because it supports the way we like to live our daily lives! For me, earth day is about saying thank you to the Creator of what He has given us~and remembering to take care of it! I am following you at both facebook and twitter! It's nice to have a reminder to do something good for the earth! i try to be nice to the earth by using my own bag when i grocery shop, and i'm going to get a composter as part of our city's composting program tomorrow morning. i just became your fan on facebook, too! People have become so disconnected from the natural world. Just yesterday I saw a bus taking a group of kids from the Mall of America after a fieldtrip, and it made my heart hurt. These kids should be going on trips to our state parks or at the very least, the zoo! Earth Day gives us a chance to remind each other that there's a lot of beauty in the things we can't buy in a mall. I am trying to teach my girls that things they do effect others, like recycling and not littering. They definitely have a love of nature and our world. Earth day this year has been the perfect opportunity to talk to my 4 year old about the importance of protecting where we live. I've got a cleaning crew all set up to clean our local beach this Saturday! Earth Day is a special reminder of how important it is to be good stewards of the land. Life would not be the same with out a healthy and beautiful earth for our children and many, many future generations. Oh yes, and liked you on facebook, following on twitter and off to follow blog! I've been making more of an effort to help my grandma with her vegetable garden this year–not just for earth day. I love Earth Day because (I hope) it brings the environment to everyone's attention, at least for one day. All the buzz about "being green" is like a background hum these days, but it's nice to have it front and center for a change. I never take plastic bags in shops, I bring my own bag. I counted the times I said: "no thank you" this week: 16 times! Ok, I had to go shopping quite often, and I'm not working at the moment, but still: that is a lot! Earth Day is special to me because it provides a chance for us all to remember and act in ways to preserve the planet. I'm a follower too. My kids have really gotten me to appreciate Earth Day–this year we are inspired to start worm composting! Thanks so much for the great opportunity! I suppose it is special in the way that I look at my kids digging in the garden: brief flashes of realizing how precious it all is..
Earth day is special to me because it makes everyone take notice of our earth and how each one of us can do something to help the earth. I do my part by recycling and using reusable bags. We are huge animal lovers and rescuers and want to keep natural habitats for all of Earth's creatures. In celebrating and recognizing Earth Day, we are continuing that love of nature. We grow some of our own food, draw on the backs of Dad's work papers and graded homework, and recycle nearly everything! Earth Day is even more special to me now that I have a daughter. I always plant something on this day and now I can teach my daughter that not only is it very important to help preserve our world but we can have fun while doing our part. Loving these fun prints and putting them on organic cotton just makes them so much better! I "Liked" you on Facebook! I'm a follower !Lovely prize. I'm a follower! These are great fabrics. Earth day means so many things and I try to live eco-friendly all 365 days! My biggest effort is campaigning against plastic bags and promoting reusable fabric market totes, which is what I would probably make out of the fabric if I win! I spent the day with my kids out picking up garbage near our local park. Wearing gloves and spending the day outside making it a clean and better place really sunk in for my kids. They said they want to do it every other week now! So- I "like you" on Facebook and I will enjoy "following" you- and while I do that: I hope to win the lovely fabrics! Earth Day reminds me of how important it is to do the little things everyday to make a difference and I'll be spending the day teaching my young children how to be considerate of the environment in everything they do. I friended you on Facebook! And I tweeted about the contest! I'm a librarian in the 1st green school in NJ. We do tons of environmental education and programming, for Earth Day yesterday the director of the NJ DEP came to visit. And I read/showed the movie of Dr. Seuss's The Lorax to my classes, and we talked throughout about planting trees to replace those we've cut down, not littering, protecting as many trees as we can. Earth Day is important to me because I love this big beautiful world that we all call home and I am ever hopeful that each and every citizen will begin to treat it with love and respect. I think Earth Day brings this cause to the forefront at least for one day of the year. You have some great prints! For Earth Day, I finally recycled my newspapers. I also became a follower of your blog. I love our Mother Earth and am so grateful for all she has given us and want to give back. I am teaching my son about recycling for Earth Day. Monaluna is one of my TOP FAVORITE designers. Thanks for the opportunity! Earth Day is important to share with children and educate them. Everyday is earth day! We pass on to our children the importance of re-using things instead of buying new everytime, we grow food in our garden and we are conscious of the electricity that we use. Thanks so much for this give away opportunity. I am following you blog too. Thankyou again. oh, these are sooo adorable! Earth Day is great because it brings us all back to remembering how special nature is! I didn't do anything special for Earth day, but I do try to be conscious of my impact on the planet in everyday life. Bringing cloth grocery bags to the market, recycling, incorporating seasonal organic and local foods into my diet are a few things I do. Earth Day is special to me because it reminds me of my goal to someday raise my own meat animals and fruits and veggies. I love local so much. How much healthier for the environment and local can you get then your own back yard? As for what I am no right now to help, I walk everywhere instead of driving when possible, and carpool when it isnt. Earth day is special because we all need to remember to care for our earth- and there are times we forget. There is so much beauty in our world and it is SO important that we care for what we have and don't take any of it for granted. While every day should be earth day, it's nice to have a special day set aside to really focus on the issues at hand. I like to go to the beach and really be aware of how irreplaceable it all is. earth day means that our carbon footprint gets smaller so that future feet can live on it! We planted a tree, didnt drive, didnt throw anything away, and had the computers/and all technology off! Today we set up a "no waste" display and incentive at the school science fair….. hoping to lower the waste our school creates. Hi, I'm gonna have to get some of the 60's beach mod surfboard and car fabric (love it) for my nephews come the fall! They live at the beach and their dad surfs. Earth day to me is a reminder to think of future generations and to live sustainably by reducing my waste, to reuse and to recycle. Earth day has come and gone, but I'm hoping that I can live greener every single day of the year by doing small things, that hopefully will add up! These fabrics are WONDERFUL! I love the collection! today I made a pair of recycled wool longies for my son! Earth Day is special because our lives and what we do effects all other living things in the ecosystem, not just humans. We don't get a second chance with Mother Earth. What am I doing? I take my lunch using a reusable sandwitch wrap that I made, and if i have to buy disposable cutlery I buy this brand that is compostable. i love earth day, ever since i convinced my school to recycle in the 7th grade (before it was cool to be green). Earth Day is important because it catches people in their busy lives and (hopefully) makes them pause and consider how their lifestyle is impacting the world around them. I spent earth day twittering eco-tips and looking into finding a composting service for the apartment building I live in (have to convince the property owner!). And I'm a follower on your blog – so I won't miss any of your news! Those fabrics are so cute! For Earth day, my school went around the community and planted saplings while spreading our cause. Like so many have commented before, Earth Day is special because of our children… there are enough ugly things they may encounter in life, I hope to preserve all the beauty on earth that we can (like this beautiful fabric;)! I just became a happy follower of your blog! And I definitely "like you" on facebook! Thank you so much for this giveaway!!! Earth Day is great 'cause it makes us all stop and rethink what our impact upon the earth equates to. By being mindful of what I purchase and throw away, of what I eat and what I grow, I try my hardest to be a good steward of the earth and teach my children the same. Hi! Fan on facebook! 🙂 I believe in sustainable crafting. For Earth Day this year, I upcycled an old spice rack I found at a tag sale! Organics are the way to go! This Earth Day my roommates and I decided would only use canvas totes for grocery shopping instead of plastic bags! I think Earth tends to be one of those blessings we often overlook! What a great day to celebrate the beauty! Also, I 'liked' Birch Fabrics on Facebook! Earth Day reminds me that it should be a daily observance for ALL of us – corporations as well as individuals. Our planet is so special, and has gotten so screwed up. On a local level, where I live is beautiful – if you can ignore the trash on the ground. Why can't people, at the very least, just do something simple like throw their trash in a can instead of out the window? I will step down from the soapbox now. I am the new follower..
Earth day is important because we have to remind people all around the globe to be aware of the things that we do that can make earth suffer. I just do reuse, reduce and recycle, and ofcourse I teach my daughters to do the same. Those are the cutest fabrics for boys!! I have 3 sons, and it's so nice to see suitable prints for them. What a great little camp shirt some of those would make! Or a quilt!! I am your followers on twitter (twitter.com/mamihku) and retweet the giveaway. And I "liked" you on Facebook. Gotta say again how much I like these collections! The colors and the themes!! What a great way to find new and lovely blogs! Love these farbics. I think I am comment number 720 so I am not getting my hopes up. Thanks for such great fabrics. Just started following Birch Fabrics! I love the Circa 50 fabrics, brilliant to find fabrics that really work for both boys' and girls' clothes. For Earth Day, my girl and me went in the rain to playgroup in the pushchair instead of the car. OH1 what beautiful fabric. Thanks for the chance to win. Earth day is special to me more now that my 6yr. old has grasped the concept of it all. Her latest comment was, "if you destroy a tree you must plant another to replace it". Don't you just love them? I also became a follower via RSS feeds. Earth Day is a reminder that we need to walk the talk rather than just mouth platitudes about supporting the cause. Now that I have a 4 month old I am more focused on every small action during my day. My most important task is to encorage my bebe to notice nature to help her understand what the consequences of daily actions are. 'like' you on facebook now! Earth day is special for me this year as I'm going to make a conscious effort to become more green. I've started groups with my members to teach them about composting, recycling and even begun the planning stages of a garden. These fabrics are beautiful and I'd love to win! Thank you so much. And I'm a follower. Now off to find out where I can get my hands on some of your beautiful prints! Earth day is special to me because it gives me even more reason to tell people about how to save our earth. I also get to help my 5 year old little sister plant an tree and that was a lot of fun. Earth day is a great reminder to reduce, reuse, take care of the land and ourselves. We are trying to use and consume less and teach our children to do the same. Living in Vermont makes it easy to see the beauty of the Earth, but also to see what we might lose if we don;t take care of it. I will definitely make some reusable linens and bags if I were to win these gorgeous fabrics. Earth day is a great day to think about all the earth has to offer and what we can do to continue to blessed with the same resources for future generations. As a child, I remember planting trees on Earth Day, now I celebrate by gardening and composting! Earth day is special because it reminds me off all the little simple things you can do to help the planet out. Taking the bus, reusable water bottles, bags light bulbs, turning things off are all little easy things. Firstly I love earth day, because it's the perfect occasion for me to spread the word on greener living in a positive way. We celebrated with a extra special dinner of local, seasonal food. It was delicious. HOlY COW! I am in love with these new fabrics! Earth Day is a great day to teach your kids about why they need to take care of the earth! Why we use fabric grocery bags and why a specail truck stops by each week to pick up "certain" trash! Earth Day is important to me especially since we moved to a house in the country. We're learning how to grow a vegetable garden. I would love to use these prints to make resuable shopping bags. Love the fabric! Earth day is important to me for the same reasons so many have already given. She's my mother, she is my past, present, and future. I share the love of her with my granddaughters. Well, Earth Day is special to me because of my 3 fantastic daughters! I want to leave our planet in better shape for them. We grow our own produce 3 out of the 4 seasons, use cloth diapers and try to leave as little a footprint as possible. Thank you for celebrating this day with a beautiful give away! My son decided that for earth day, we should walk down to the river that's close to our house and pick up trash. It's important to take care of the earth! Today I'm picking up trash along the way. did I leave my info? It's important because this is the only planet we have! I bought lots of plants so I can grow some of my own food. Happy Earth day! What a fantastic giveaway! My sister and I make fabric dolls and toys for babies and children. This fabric would be a welcome addition to our stash. As our contribution to earth day, and to mother nature… we strive to produce a little waste as possible in the production of our dolls. We repurpose every scrap we also use upcycled and recycled materials. Your upcoming lines look WONDERFUL! Especially Marine. Earth day isn't particularly important to me (I am not into special 'days') but taking care of the earth is important to me and my family because it is God's earth and He's given it to us to enjoy and take care of. We try to make a difference by reusing, recycling, composting, cloth diapering and more. We try to teach our children how to be good stewards of the earth. Very nice giveaway – thanks! Earth day brings us back to nature and allows us to stop the rat race and spend quality family time together helping the enviourment.Over in Oz we have clean up Australia day and earth hours everyday at our house is what we call a help the earth day. earth day is important because we need to stop and realize what impact we are making on the areas around us and what we can personally do to leave the world a cleaner and better place than when we entered it! I am just going to enjoy the beautiful weather outdoor with my son. I also Liked you on FB! Earth day is a reminder for me to teach my kids about taking care of the earth. Old Hawaiian culture teaches that we belong to the land (and not vice versa) like children belong to a parent. I try to instill that in my kids. I'm a follower now :). I have a daughter and husband I like to share earth day with every day. We try to recycle as much as possible and reuse or give away what we can. Thanks for the giveaway. I'm a follower! Earth day is specially spent with my sons at an Earth Day event to better understand how we can help in small ways each day! Thanks for the great giveaway. I have tweeted about this awesome giveaway! I have hit the "like" button on your facebook page! Hi! I love earth day because I am a grandma and I want to leave them a beautiful world. One way I try to contribute and indulge myself with my favorite hobby is to sew from recycled thrifted clothing to make new garments, home dec and other useful things for our own lives. Thanks for giving us a chance to win some of your beautiful fabrics to add to my sources. I am now a follower now that I found you. we are making a conscious effort to use fewer paper products like napkins, paper towels and plates, etc. and you have a new blog follower.. thanks for the opportunity! I've been recycling fabrics for purses and other items for quiet a few years now and I always recycle papers, plastic, glass, etc. The fabrics are wonderful-some great boy colors!! Earth Day is special to me because even though our family is spread far and wide, we stay connected through our long-standing family tradition of planting trees to celebrate. This year we welcomed a new generation to the tradition. I love the fact that earth day has been around since I was a kid and now is more important and more recognized. Earth day is a great opportunity to sit down with my kids and discuss all the reasons and ways we can look after the planet. These are so fun–I love the scooter and VW van print. My son is refinishing a red VW and I could see making something for his car out of these! I plant a garden with my kids to help them be connected to their food. We all love it! I tweeted: http://twitter.com/AnneH76. Sorry – I don't know if this is the right way to link. Am new to Twitter! Earth day should be everyday, that's how important it is for us and for our children who will be living in this world of ours. Earth day is special to me because it shows just how mainstream 'saving the earth' has become. It gives me hope for the future generations. I am going to try to really educate my young children about the importance of being 'earth aware' so that things like minimizing waste, planting gardens, and appreciating animals, bugs and birds, will become second nature to them. Earth Day is probably best seen as a reminder of what we have, how fragile it is and what we can do to keep it! And , of course, pass the word on! Aside from being the earth's DAY, Earth Day is special to me because it is the day I met my husband – 16 years ago. Earth Day reminds me of the importance to bring green actions into my daily life, for my children and for the generations to come. Beautiful fabrics! My older sister, who has inspired me and supported me in everything, was the first teacher in her district to bring Earth Day celebrations (and recycling) to the school where she taught. Because of her, I always think of how global events spring from the actions of individuals when Earth Day rolls around each year. i love earth day because although i feel like i'm trying to make a difference every day, earth day is a chance to be really mindful of my actions and talk about the environment with people who'd normally shy away. FANTASTIC FABRIC!! Can't wait to win it to do some sewing. Earth day is important to me because it reminds me of my connection to the natural world, inviting a step back from the craziness of everything I have to do every day. earth day is important because it's a day when I can appreciate the earth just the way it is! I will make a differenc by using eco friendly products and eat natural foods! followed, liked and all this from wonderfully green Colombia. Earth Day is important because it's one of the few days in which people are made aware of this connection to the entire globe and their actions are a part of this. Oh my goodness! What a great giveaway! I am new to the sewing world and would love to win these fantastic prints. The one with the rockets is too cute! Thanks for the chance to win. Earth Day is special for me because it's an excuse to get crafting with my recycled linens, and to make a difference today I've used a green grocery bag. Earth Day is special for my family because we annually go out to the gorgeous tulip fields in our valley and celebrate with the locals (no tourist allowed that night). Trolley rides in tulip fields seems like a nice Earth Day celebration. I follow your blog, follow you on twitter, "like" you on FB & I wrote about the fabric giveaway on my blog for my "Fabric Friday"- then tweeted about it. Thanks! What a wonderful giveaway!I recycle at home and whenever I can at work. I use my own bags when I shop, also I find myself turning off lights in rooms when not in use. I also follow and re-tweeted your giveaway post. Thank you!! Happy Earth day! Earth day is special because it is a way for the main stream to see that small changes make a difference and that everyone needs to be concerned. Earth day is important to me because when I was a kid we watched a video in science saying that the oceans were going to dry out by the time we were in our 30s. Scared me half to death. I'm 26 and the oceans are still here and, while that video's claims may not have been backed by much, I can't help but wonder what the earth would have become by now if people hadn't gotten smarter about how to live. Green cars, organic everything, recycling…we're getting back to the basics these days and Earth Day is just a reminder of what's possible when we all work toward something together. I'm now following – why wouldn't i??? and I'm a facebook fan! (Kerry G.) I'm the one that's going to make thumbsucking covers with some of this fabric!!! We moved to a house that is centrally located in our city and are living completely car-less! Bikes, feet and bus for transportation. Good for the environment and good for our overall health. ALthough I try to live each day as an Earth day, I love that this day draws attention to what we all could do to help our planet! I've been subscribed to your RSS feed for…a long time! Ooh, Now I "like" you on FB! Earth day is special to me because its one day when everyone unites to try and make a difference. I am a follower, and I 'like' you on facebook! I love that on Earth Day we all are more mindful about taking care of our planet and it's resources. It inspires me to find new ways to live a "greener" life. I remember Earth Day being a big deal to me since elementary school. My family doesn't just do something on this day for the earth but everyday. We use cloth diapers, recycle and re-use as much as possible, and use canvas shopping bags among other things. Oh and I like you on facebook! 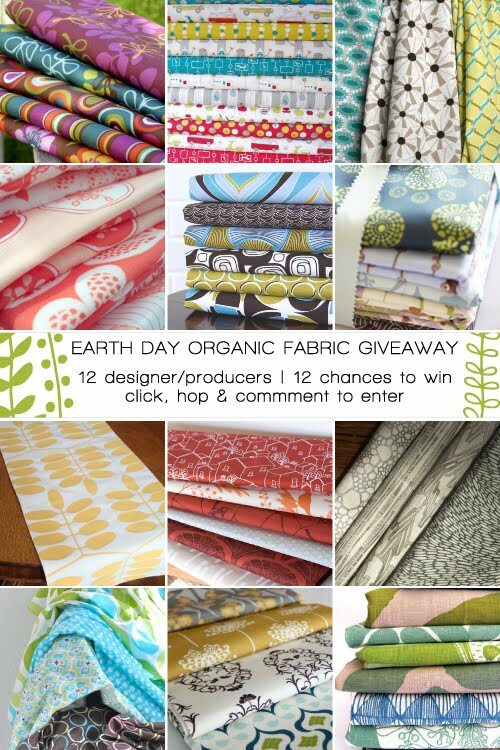 Earth day…a great day to win lovely organic fabric! Thank you! I love your fabrics. Do I see cars and scooters and rockets? Those are awesome prints. How fun to make soft toys out of this collection. I have started following the Birch blog. I love the fabrics. I make cycling hats and this fabric would be perfect! I'm glad to learn of your company and how much of a difference buying organic cotton can make! We have recently become aware of the delights of growing some of our own food and striving to buy as much as we can from local farmers! wow! these fabrics are gorgeous!! & our family has made a commitment to no more plastic bags (from lunch boxes to grocery shopping). we also are firm believers in shopping & eating locally. now i'm one of your blog follower's as well. looking forward to hearing more!! Earth day to me is a day that i hope makes everyone think about what they could do even in the smallest way to help this wonderful planet of ours. Happy Earth Day! It's such a good way to remember how important it is to do our part in making it a better place to live. We've been teaching our 2 year old how to do our little part, such as conserving energy and recycling. Thank you for the generous giveaway! Earth day is important because I like to like living in a rural area where there is lots of natural beauty. We all have to take care of the earth if we want to have a future. Not specifically for Earth Day, but I recently moved closer to work so I can walk instead of drive. Now I only drive about once per week! I love the new marine line – whales! So cute. I'm a marine conservationist, I try to take care of the earth everyday! PS: I've also "liked" you on facebook! Earth day means more to me now that I have children. I want to pass on the importance of getting back to earth. I grew up in a small town, but am raising my children in a city. We do what we can, growing some vegetables and walks in the "forest". I am more aware of how "nature" is not so natural anymore with genetic modifications, hormone injections, etc. I would love to feel your fabric. Thanks for sharing! I wish I could have LOVED you on Facebook, but I had to settle for Like! Earth Day is totally important to our family — we helped out at a city-wide cleanup day today and the kids have a newfound appreciation for how important recycling and avoiding littering. I didn't do anything special for earth day, but my husband and I are trying to teach our kids about the importance of caring for the earth. My 3 year old loves sorting the recycling and helping out in our vegetable garden. We can do little actions and make a big difference for our environment! Earth day is important even more to me now that I have a toddler. We spent it doing some nature trails and showing him some plants. It was wonderful. Earthday should be everyday. Every day should be earth day! I'm a new mom and just started cloth diapering, and we're celebrating spring next weekend by planting a raised garden bed and starting a compost. I grew up in a different country and when I first moved here when I was 16, I was shocked the level of recycling and reusing here in the US. Where I grew up, recycling and reusing is instilled when the kids are in preschool!!!! It is not an option, or get any money back. It is about the environment you live in! Earth day was special because my son rode his roller blades to school on his own initiative to reduce use of the car. I use Earth Day to refocus my life and make sure I am doing whatever I can to reduce the waste created by my family and the impact we have on the environment around us. Why is Earth Day important to me? Because it shows, and reminds me on how I can personally contribute to protecting our environment and the health of people that live near and far. By informing myself, by being a conscious consumer. I love your initiative! Hello! I'm a follower and I "like" you on Facebook too!!! ! I like Earth Day. It gives everyone a chance to take a deep breath and focus on the environment, to recommit to doing the small things that really do make a difference. Earth Day is important as we should not be living in a world so dominated by humans… the Iceland volcano has taught us that – Gaia is bigger than us and we must respect her. The stopping of all air travel in the UK and other parts of Europe must be something we learn from – that the environment is enriched and returned to it's proper and natural state the instant we stop poluting it, but we need to take that step in the first place. Earth day is a time to reflect on how we treat our planet. As well as the usual recycling and energy saving I try to put into practice everyday. I travel the earth on the internet making my carbon footprint much smaller and my life greatly enriched. Earth Day is a great chance to rethink old habits. 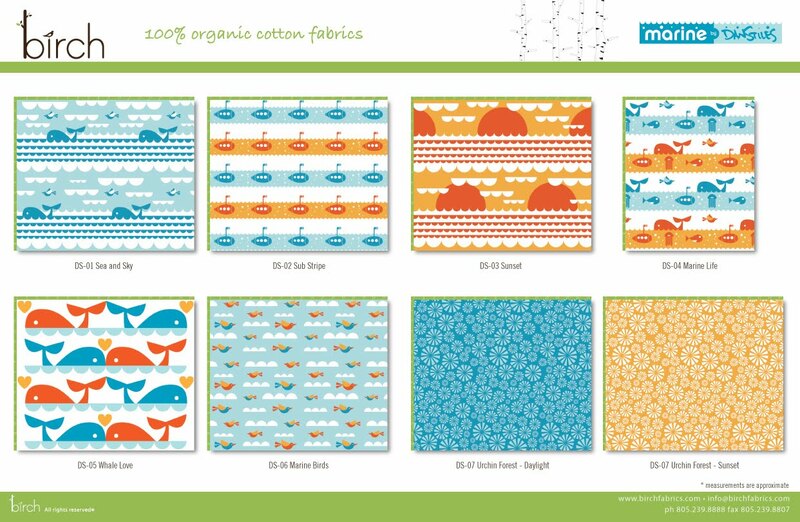 Right now I'm thinking that I would love to use some of these beautiful organic fabrics for reusable napkins instead of the paper towels we currently use!! Earth day is special because we should be reminded to take care of what we are blessed with. oh I hope I made it…ack! i think earth day is special because it reminds us what a precious (& vulnerable) earth we live on and that we should all continue to strive to take care of this planet for its sake the sake of the future generations to come. I'm doing alot of recycling & reusing these days in hopes to help out in some way…I've followed you on FB and Blog 🙂 Thanks for the opportunity to win this fantastic giveaway! Those fabrics are beautiful! I remember celebrating the first earth day by planting a veggie garden at our school in NYC…. so much fun and so unusual for most of us! I thought i had commented but I don't think it went through! I 'followed' you and 'liked' you! I remember Earth day from when i was in elementary school and we would plant a tree with our class in the big play field behind the school, then we would go plant seeds and take them home in used milk jugs that we were supposed to bring from home. back then it was just a fun project, but it's certainly stuck with me and now i know the importance of the day as well as having fun memories as a kid! Earth Day is a great way of spreading awareness and just stopping to appreciate the beautiful place that we live! Now Shipping, Elk Grove, The Grove Canvas, and Mod Basics 2! !